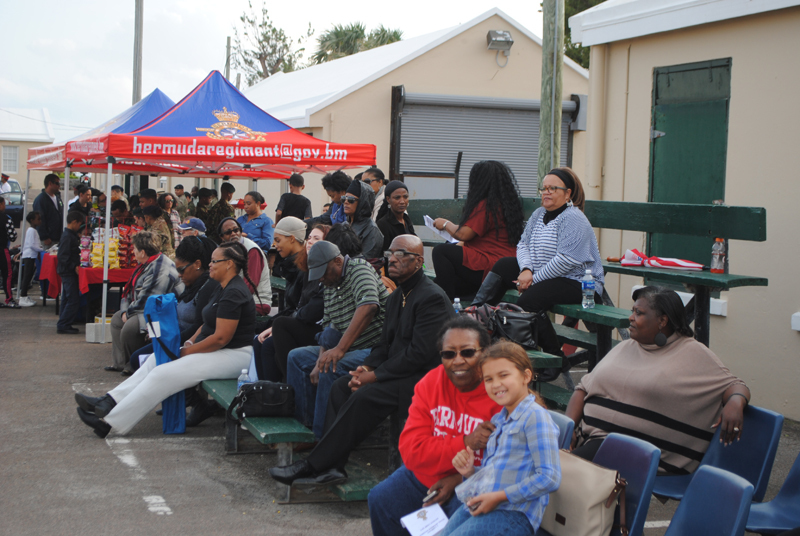 The Royal Bermuda Regiment’s latest recruits started their careers as soldiers at the weekend with a special parade and prizes for the top achievers. 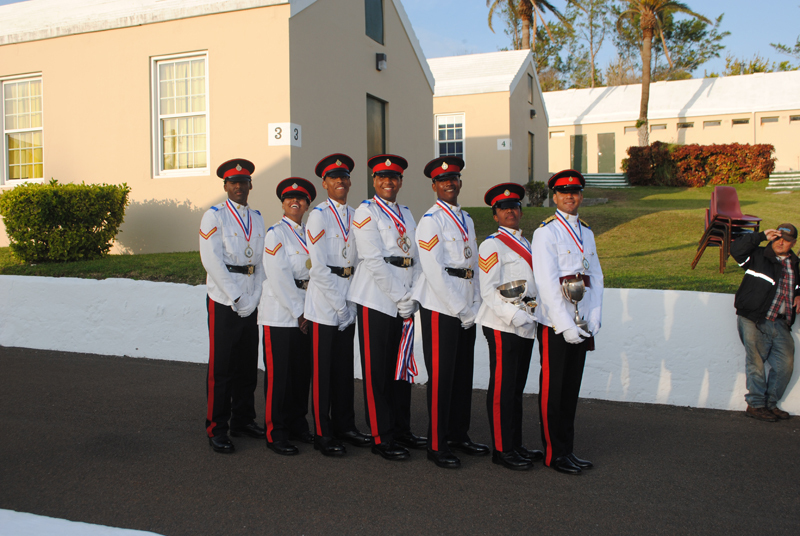 The leaders of champion 7 Platoon line up with some of the awards won over Recruit Camp. Lance Corporal Ryan Eve, who joined the RBR just two years ago and led a section in 7 Platoon, picked up a string of awards for his own performance and that of his troops, including champion section, best section leader and another for the inter-section drill competition. 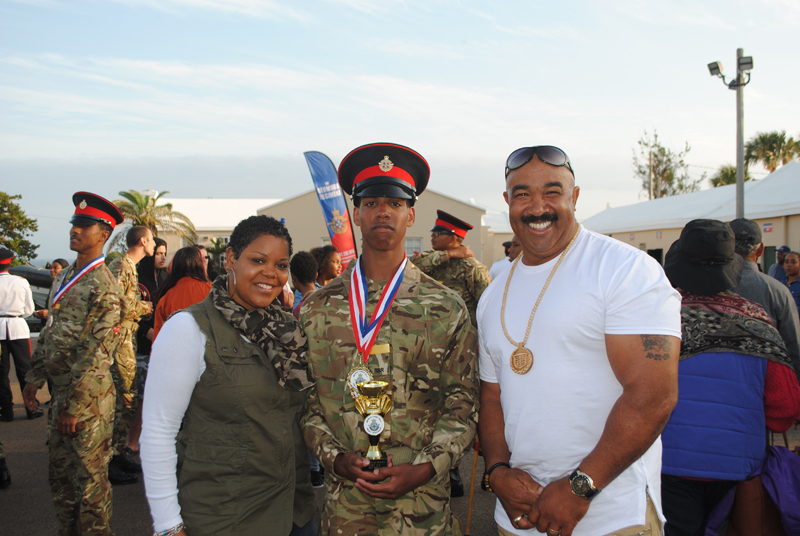 Private Umar Durrant, who took the prize for top recruit, with proud parents Tuere and Milton Smith. 2nd Lieutenant Samuel Hewitt, 24, who works in customer service for Argus, led 7 Platoon to champion platoon status after finishing officer training at the prestigious UK military academy Sandhurst only three months ago. The family and friends of new RBR recruits watch the passing out parade at Warwick Camp. 2/Lt Hewitt said: “I’m very pleased – everybody worked extremely hard for this and they deserve all the awards they’ve got. I could see the morale. They worked together as a team. 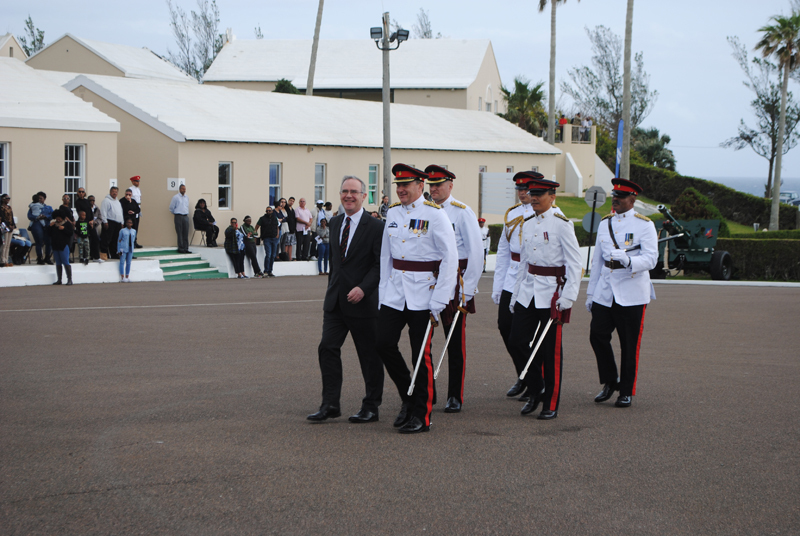 The passing out parade was attended by Governor John Rankin, Acting Premier Bob Richards, Minister for National Security Jeff Baron, other dignitaries and proud family and friends of the newest generation to join the ranks of the RBR. 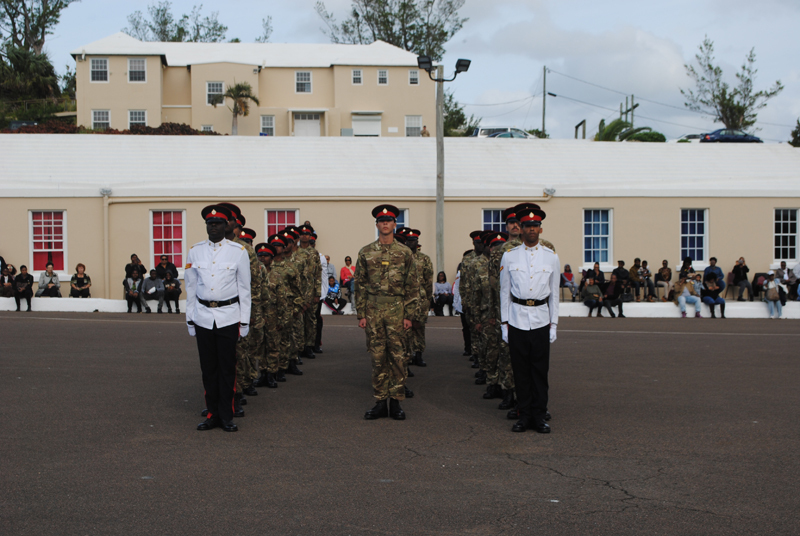 Governor John Rankin, escorted by RBR CO Lt Col David Curley and senior members of the Regiment, arrives for the start of the Recruit Camp passing out parade. But he added he had been impressed by troop morale and their determination to overcome obstacles and difficulties. 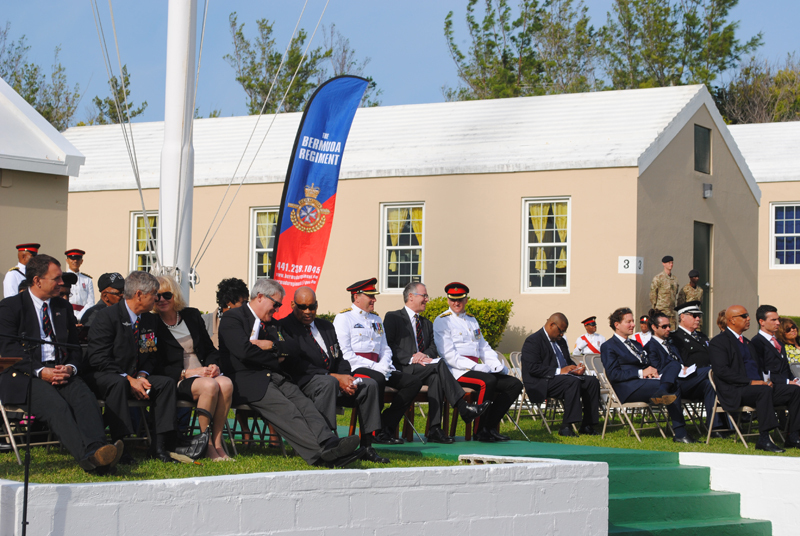 Dignitaries watch soldiers on parade as this year’s Recruit Camp draws to a close. And he added: “I should also thank the families of the recruits for their support. Your continued support as they carry out their service in the Regiment will also be needed. Soldiers of Recruit Camp 8 Platoon show of their drill at the Recruit Camp passing out parade. 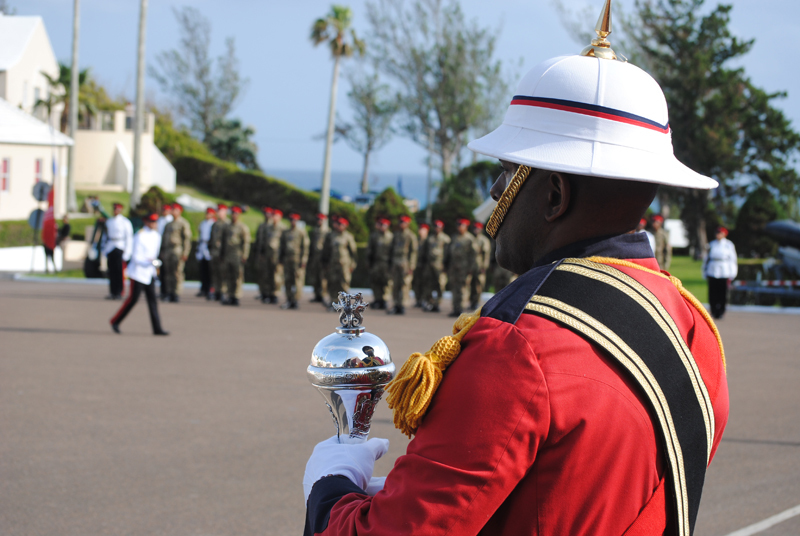 He added: “The Royal Bermuda Regiment has been embodied on average once every two years. We are citizens of a small, remote and beautiful little island of limited resources and are defined by our friendly nature, can do attitude and independent spirit. Thanks for volunteering your services! Good on you. I did my three year’s, but I didn’t volunteer (wouldn’t of either). Made friends I would have never of met otherwise though. It’s reassuring to know that we have a Regiment to call on in case of emergency. I understand 90% of the volunteers are unemployed and are in ‘just for the money’; not a bad thing though. The ‘in your face’ in my space is an issue for some; hopefully they all come out better citizens.